Well……THAT was a short break. Unbelievably, it’s time to ramp things up for the 2018 CSA season. The cellar grow room is full of transplants biding their time in the (relative) warmth under bright lights until it’s time to plant them in the hoophouse or in low tunnels. Seed orders are coming in every day. All of my wonderful workers are coming back for this year. I’m in significantly better health than I was last year at this time. We’re going to have a great season! If you’re unfamiliar with how a CSA operates, please scroll down through a few posts to get a sense of what’s going on here. I’m going add a second post today with answers to some frequently asked questions. For heaven’s sake, don’t write a check until you take a look at that post. This isn’t for everyone. Read through it before you decide if it’s for you. $240 (that’s less than last year!). Eight bags. Delivery options are limited this year to Harrisburg (Penbrook area) or my farm on Tuesday, or the Broad St. Market or my farm on Friday. I can also send bags in to CMS with Greg. Specific delivery dates are going to stay vague for now. Here’s why – the last five winters have been totally different from each other. Some years there’s great greens early in the winter and then it gets sparse, other years it’s the opposite. Honestly, I’d rather send you a bag when I have perfect produce, instead of trying to stick to a schedule that may or may not make sense due to weather. Since the dates will be flexible, there will be emails with reminders, several days in advance of each pickup. So here’s what I know: you’ll get one bag on the Tues or Fri before Thanksgiving. I’m hoping for roughly every two weeks after that. But if there’s a weeklong blizzard, then, no. Let’s just see if we can roll with this and see how it works. Winter CSA will also, then, be more flexible from your end as well. I’m limiting the number of winter shares available, so, frankly, you can switch around from one delivery to the next if you want. The winter produce usually keeps much longer than the regular season, so if you choose on-farm pickup, you can delay by a day or two without any problems. When I send out the delivery reminders, you will also have some options to add if you choose to do so. You might be able to switch some items, or add baked goods or homemade soups at an extra cost. If there are eggs, they’ll be available as an extra. I really want to experiment with this add-on idea during the winter season, so I can see if it’s at all feasible for the regular season. I usually do a signup contract but honestly, winter CSA is nearly always made up of regular season members anyway and I already know all of you, so let’s keep it simple. I need a check for $240. I need to know you’re in. I need to have a working email that you check regularly. Other than that, we’re good. Send me an email if you want to be in the winter CSA, and I’ll get in touch with the particulars. Hey friends, it’s time to get these numbers settled in for the year. If you’re planning to join, please have your contract postmarked by Sat, May 6. Also, the Camp Hill pickup is confirmed at 129 S. 19th St, across from the Fredericksen Library. Same location as previous years, but the house has a new owner! Whew, got it done! The info for this year’s CSA is on the top of this page. Want to join? Print out the contract ^^^ , fill out a check and send it in! Bonus bag(s) for early signups. Have questions? Start by reading the “about the Cool Beans CSA” link, also at the very top of this page. Scroll down through and read a few posts – if you’re really new to this, be sure to read the one titled “Reasons Not to Join a CSA”. Still have questions? Email me at katie@komta.com. I will get back to you as soon as I can. Another option is to visit the Cool Beans CSA Facebook page. It’s also possible to leave messages here on this site, but honestly, it’s slower for me to get to the messages here. Email and Facebook are quicker. I’m working on the calendar and should have the updated contract available soon – just hit a snag with WordPress and I want to see if this posts, first…..
$250 for the season, which will be eight bags, delivered every two weeks, starting Tuesday Nov. 15. Discount price of $225 if you pick up at the farm in Dauphin. You’ll choose a pickup spot: Harrisburg (Penbrook area), Camp Hill (location to be determined), New Cumberland, Middletown or Mechanicsburg (all in the downtown areas). Deliveries are made in mid to late afternoon on Tuesdays. You’ll send me an email with your location choice to reserve your spot, and I’ll send you the info about where to send a check. What’s going to be in the bags? Let me be honest here: this will be the fourth winter CSA. each of the last four winters has been a completely different experience in terms of weather. It’s not just the cold temps that are a factor – cloudy days can really slow things down. On the plus side, my skill set has improved each year, and I’ve learned more about creating microclimates in the hoophouse, and which varieties do the best. I am planning on many kinds of greens, winter roots, herbs, value-added items (like local cheese or wheat flour). in addition, Winter Beans are welcome to come to the farm to gather pine greens, holly and winterberry for holiday decorations. 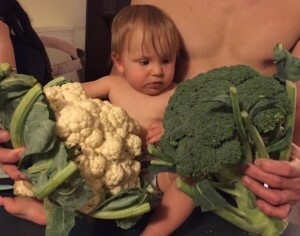 this picture of Baby Bean Thea contemplating broccoli and cauliflower from a recent regular season bag has nothing to do with the winter CSA, really, but………yes, it does. This is why I do what I do! After about ten attempts to convince the computer that the printer is, in fact, attached to it, exactly as it has been for years, I gave up. It thinks there is no printer, and I can’t convince it otherwise. So, no printed newsletter in your bag today. Part of me likes the idea of just doing the newsletter online every week. Fewer dead trees, fewer soggy newsletters if it’s raining. But i pack for the lowest common denominator among us, and that person is actually ME. If I were a bag-receiving Bean, I would never, ever bother going to the computer and going to the website to read about the bag’s contents each week. If the bag contained something I didn’t recognize – I know this about myself – I would put that item on the kitchen counter and hope that somehow, mystically, a message from the cosmos would arrive enlightening me. Eventually it would rot and I would throw it into the compost, still clueless. But I’d never bother to actually look for the newsletter online and find out. Strawberries. You have strawberries, and they are perfection. You probably don’t even care what you have otherwise, because you have strawberries. Enjoy. They are magical this year, just the right amount of rain, and then strong sun as they ripened this past week. You have two bags, and we sure hope they’re different. One should be kale and one should have lettuce and spinach. Now, here’s the thing. We got to the end of the packing process, the very last bag, and found that we had two bags of lettuce/spinach and no bags of kale. This means that someone’s bag has two bags of kale and no lettuce. So, we went through every single green bag, but couldn’t find the mistake. This now means (it’s sort of like a flow chart of screwups sometimes) that either someone has two bags of kale but we couldn’t find that bag, or that we packed one too many lettuce bags, or one fewer kale bag than needed in the first place. By now it was time to pack the bags into vehicles and get on the road, and we were aware that there was bad traffic heading out of town, so essentially we gave up. Carl, whose bag was packed last, has two lettuce/spinach bags and no kale. 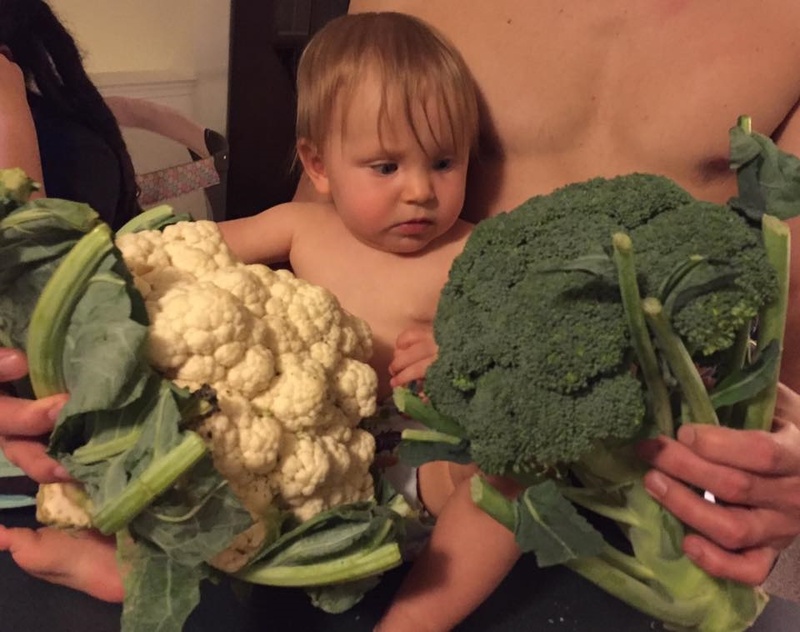 Someone else, maybe, has two kales. We’re sorry about this, but we just couldn’t solve it in time. This sort of thing is why your farmer often drinks heavily on Tuesday nights. Sigh. You have snap peas if you’re a full share and radishes if you’re a small share; that worked out best for this week. The herb is mojito mint, which your farmer has thoughtfully tested in multiple mojito recipes and pronounced them all yummy. Green onions. the last asparagus for this season. (this was, b the way, the first year for the asparagus bed, and there’s a whole other bed coming on line next year. The first bed will bear more heavily, and the newer bed will have some gorgeous purple asparagus.) If you get eggs, you have the right number this week, and we’ll start adding some extras next week to make up for last week’s shortages. The ladies have recovered from the fox-induced trauma of last week and are cheerfully popping out eggs again. Thank you all for returning your green bags each week. We have no spares at all, so it’s a great help to have them returned. Otherwise, we’re less efficient, and, you know, might start messing up the kale bag count or something. Otherwise, well, it’s been hot and sticky, enough so that the usual no-whining rule was suspended during harvesting and prep, and there was considerable griping. But the gardens look good. The big plants sale weekends are done, and now I’m getting a lot of the extra plants in the ground. We have the first baby tomatoes forming in the greenhouse, and there will be squash in next week’s bags. The dreaded allium leafminer showed up in the greenhouse but not in the field, which is actually a good thing in the sense that it means I can take some preventive measures for the field planting – there are two organic sprays that are safe to use, and they can be effective if timed correctly. My guess is that the adult leafminers were attracted to the warmer greenhouse environment a few days earlier than the field, so I have a short window in which to apply the spray. If we’re lucky, this will hold them off and we’ll be able to harvest full size onions later it he summer. There’s baby turkeys on the back porch, which let me tell you is a special olfactory treat in hot weather. They’ve got to stay there until they are fully feathered and no longer need the heat lamp to stay warm. Some larger CSA programs accept members year round. With a relatively small acreage, that’s not possible here. This is the point where I need to know numbers for the season so I can plant accordingly. If I keep the registration process open and guess incorrectly, I risk having an insufficient amount of everything, or far too much. So it’s time to make a decision. If you have any questions, hit the contact button at the top of the page, and send me a message.